First, I will discuss irregularly-shaped backers, and then I will explain how to make custom-shaped backers for both indoors and outdoors. The last section about custom-shaped backers for outdoors should be useful for people making mosaic signs and placards. If you want more of a random “found” shape instead of a specific shape, then the solution is to use a piece of scrap plywood or flagstone depending on whether or not the mosaic is outdoors. For indoor mosaics, you can use a piece of 1/2″ cabinet-grade plywood, and a local carpenter or cabinet maker can give you more than you could ever use. Check with friends and their spouses for a few pieces of scrap, or you can buy a sheet of cabinet-grade plywood at a building material store such as Home Depot or Lowes and have a friend cut out what you need with a jigsaw. You can also buy a decent jigsaw for about $75, but make sure you follow the safety instructions and maybe watch a safety video or two on Youtube if you are a novice with power tools. For outdoor mosaics, you should not use wood or adhesive. Wood doesn’t even have to get wet for the humidity in the air to swell and warp it. Instead of the glue-then-grout method used for indoor mosaics, you should use thinset mortar to attach the tiles to a stone or masonry surface. Concrete backer board can be used for rectangular and circular mosaics that have some sort of frame (such as the rim of a metal patio table), but the edges of concrete backer board can be crumbly, and that makes it a lot less useful for irregularly-shaped mosaics where the edges are left unfinished, such as you see in the fragments of ancient Roman mosaics displayed in museums. To make an irregularly-shaped outdoor mosaic in the style of a Roman or Greek fragment, use a piece of flat flagstone such as can be found at stone stores, landscaping stores and some higher-end lawn and garden centers. Avoid slate and sandstone, especially the softer varieties. You can get a general idea of how soft or brittle a type of stone is merely by paying attention to how it has been breaking or scratching or weathering in the big piles or stacks at the stone store. Slate is good and flat and smooth, but it tends to be thin and break too easily for most sane people to care about mosaicing on it. For indoor mosaics, 1/2-inch cabinet-grade plywood is my preferred backer, and it is sold at most building material stores. It comes pre-sanded and is more resistant to warping than the cheaper plywood used for construction sheathing. There also fewer if any internal voids in the plies of wood, so the edges are stronger and look neater. The few extra dollars for cabinet-grade plywood are worth the cost. The shape of your backer can be drawn directly on the plywood with a pencil, or you can first draw the shape on cardboard or paper and then cut it out and use it as a stencil and trace the shape on the plywood. Cutting the shape out is best done with a jigsaw, which can be bought for about $75, but you can ask friends and their spouses to do it for you if they have one. Most people who work with carpentry or cabinetry will have one, but if you decide to cut it yourself, make sure you watch an online safety video about using jigsaws first. In my opinion, jigsaws aren’t nearly as dangerous as circular saws and table saws, but novices should be extra careful when using power tools. Metal isn’t recommended as a mosaic backer, but if you are mounting the mosaic outside, then metal will probably be involved in some way, at least in how the mosaic is attached to the building or post. The most obvious solution is to have concrete backer board set in a metal frame made from angle iron, and this frame can have mounting studs (bolts) welded to it prior to painting it and inserting the backer board. I don’t recommend hanging mosaic signs from chains because mosaic work is heavy, and intense wind from storms can turn the sign into a battering ram. Also, the chains would need to be checked periodically for wear, and the artist cannot guarantee that the owner of the sign will do this over time. 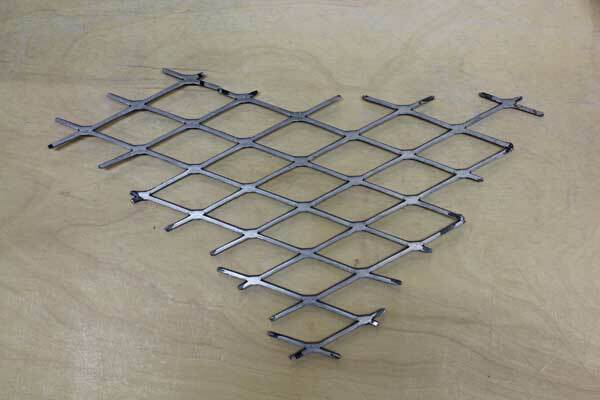 Of course, a frame made from angle iron is really only practical for rectangular shapes. My approach for making a custom-shaped mosaic for outdoors was to put the steel inside the concrete. Essentially, all I did was cut out my shape in 3/4″ expanded steel using a cardboard pattern as template, then weld mounting studs (bolts) to it, and then I encased it in thinset mortar, which is a type of sticky concrete. Expanded steel 3/4 inch. The 3/4 inch measurement refers to the size of the internal holes, specifically the minor axis (shorter dimension) instead of the longer side-to-side dimension. I used my cardboard template to outline two pieces of expanded steel, and I made sure that the direction of the expanded metal was oriented at 90 degrees between the two pieces. That way when I welded them together, I was sure that the holes would not line up perfectly. Instead, I wanted the holes in each piece of metal to be partially covered by the other sheet. This structure was made from scraps of expanded metal I had in the shop instead of two pieces expressly cut out for the job, but notice how I made sure the expanded pattern in the top and bottom layer are still rotated 60 degrees from each other instead of perfectly lined up. A rotation of 90 degrees is optimal for ensuring the holes in the resulting structure aren’t too large. Once I had my shape welded together, I welded some 3/8-inch bolts to it to that the finished mosaic could be bolted to a wall. 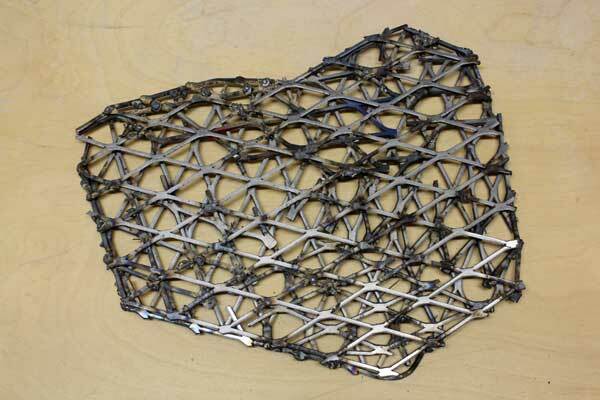 Then the frame was scoured with the stiff wire brushes that are used to clean welds. This is the underside of a finished outdoor mosaic backer. Note the three mounting studs. Also note that the top surface (facing down) is a lot smoother than this backside. I made the top surface perfectly smooth by applying a second coating of thinset to the top face and then setting it upside down on a piece of construction plastic. Thinset mortar contracts or “thins” as it cures, so there isn’t much point in making your surface perfectly smooth with the first application. Of course you want it level, and you don’t want any large pieces sticking up, but there is no need to try to smooth it to a finished surface with a trowel. If you do smooth it perfectly, you will notice dimples that get larger each day for about a week as the thinset contracts internally. Due to this internal contraction and the resulting dimples, I wait about a week before applying this second coat, which mainly involves spreading the thinset on the face with a putty knife or trowel and then turning the mosaic face down on a piece of construction plastic. Roll of construction plastic. Grout does not stick to plastics in general, but this stuff is especially good about being stick free. Construction plastic is sold in large rolls at building material stores. 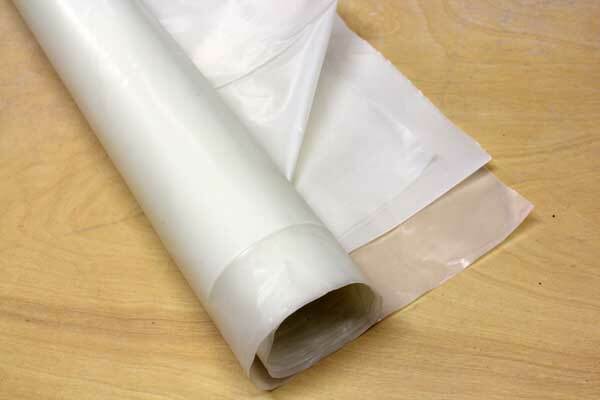 A cheaper alternative is clingy kitchen wrap such as the Saran Wrap brand. Kitchen wraps aren’t as strong, and they don’t tend to stay put even when taped down, but an easy solution to this problem is to find a large piece of cardboard and wrap it around the cardboard about 3+ layers deep. Then you can lay the covered cardboard on your work surface. Use this improvised method and these instructions at your own risk. Like all the instructions on my websites, these instructions haven’t been rigorously tested in corporate laboratories. Neither can they anticipate all the potential mistakes an individual could make in executing them. As always, if you are installing anything for a client, it is your obligation to evaluate the strength, safety and longevity of your art, especially if it is to be displayed in a public space. All that being said, there isn’t too much if anything in these methods that uses materials in a way that they aren’t commonly used or at least in a similar way. Unless you weld things in an amateurish way or fail to clean the welds, then the backer should have a very long life, even outdoors. The only mode of failure I am particularly concerned about is the possibility of the bolts rusting through over time, although that would be a concern with any heavy sign mounted by bolts. This entry was posted in Improving Your Art, Material and Tool Information and tagged backer board, outdoor mosaic, presentation on May 1, 2014 by Joe Moorman. Exactly how are the protruding bolts secured to the wall of a structure? Simple if it were applied to a thin surface where a nut can be attached on the backside, but what hardware do you use on a thick solid wall? Second, you mentioned in another article the corrosive nature of the cement on metal. Is there any pre-treatment to the welded metal before the thinset is applied to protect from corrosion? Thanks for your very informative site. These are actually great questions. I made my studs so that they could go straight through some plywood wall partitions I had in the gallery area of my warehouse/studio. The studs went through the holes in the plywood, and washers and nuts were secured from the reverse side of the wall. Of course, this would not be an option for a masonry wall. Instead, you would mount some steel mounting brackets to the masonry wall, and these brackets would have a center portion raised about 2 inches from the surface of the wall. The mounting studs would fit through holes in the raised portion of the bracket, and washers and nuts secured underneath. The feet of the bracket would have bolt anchored into the masonry wall. The studs would pass through the raised portion of the bracket which is drawn as a dashed line. Of course, there are some safety concerns, and you have to make sure you aren’t overloading the wall or the mounting fasteners or anchors. For one example, I don’t think you could mount a mosaic of any significant size in this way to an ordinary cinder block wall because cinder block is so soft and crumbly that the anchors could actually crush the material supporting it. 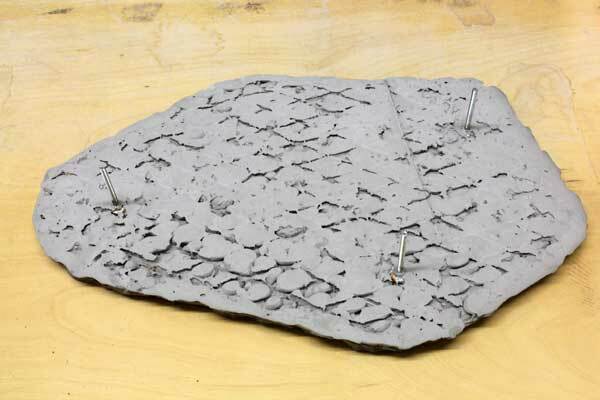 In that case, you might need to consider novel solutions such as filling individual cinder blocks with concrete via drilling a hole or making your mounting bracket one large plate with numerous anchor bolts into the wall. Of course, if there is any doubt about whether or not you are overloading the wall or otherwise compromising the structural integrity, then you need to consult with an architect or engineer. This doesn’t necessarily mean spending money or overkill. Often you can ask around at school or church or whatever organization that is involved in the project and find the expertise you need. Even if the project is for your elementary school, you still have all those parents, some of whom are likely to be qualified in some way to help. Here are some other points I wrote about Architectural Mosaic Safety Issues. You would not want to coat the steel skeleton prior to encasing in thinset mortar or some other form of concrete. You want the steel bare so that the concrete can bond to it directly. In fact, if you over-polish your welds with a rotary wire brush, you might want to skuff them with the coarse side of a file before applying the concrete. Steel rebar can rust inside concrete if moisture penetrates along metal sticking out of the concrete (or cracks), but steel inside sealed concrete is fairly safe and stable. That depends on what type of floor the grout fell on. In all probability, the damage is probably already done. Any thoughts on what to back a metal mailbox with so that I can mosaic it? Although the manufacturers don’t recommend thinset on metal because it can cause the metal to corrode, I see it done all the time on metal mailboxes. I am laying down a back patio with large flagstone pieces on top of sand and then grout in between the flagstone. I’d like to lay a mosaic design into or between the flagstone as well as add some glass into the grout here and there. What do you suggest I attach my glass to as a backer between the flagstone and into the grout? With what adhesive? And how do I get the glass up to same level as surface of flagstone after it’s been placed on top of sand? I apologize if you have already covered this. I see similar ideas in your blog but nothing exactly like. Thank you for all the information and detail you share. I was so relieved and happy when I found your site! If the gap between the flagstones is wider than 1/8″, then you need to put some form of concrete with small pea gravel in it instead of plain grout. I make a structural concrete by adding sieved pea gravel to thinset mortar, and it is very strong. You would need to lay this concrete so that it is lower than the surface of the flagstone by the thickness of the tile. Hello! I have a “yield” road sign and would love to cover it with a mosaic design and post it on a sign post in my garden. The road sign is traffic grade, rust-proof .080″ aluminum. After I clean the sign, can I just adhere the tiles with thinset mortar? Is there anything special I should do? Or is this not a good idea to begin with? You could cover it in mesh and thinset as described in this article because metal isn’t a good backer. I’m not sure if the metal would cause problems with the differences in thermal expansion, but thinset is tolerant of displacement, and so you should be fine.